It’s pretty well known now that I’m a big fan of Total War. I’m also a huge Three Kingdoms fan, which made it all the better for me when I got a hands-on with Total War: Three Kingdoms last month. During the same time I got a hands-on, I was also able to interview members of the dev team and ask a myriad of burning questions. I still have so many, but one major question has finally been answered: I finally know when I’ll be able to get my hands on the game. 7th of March, 2019. That’s the fateful day, a time I’m half-tempted to take a few days off of work to play a game. In addition to the release date being announced, so has an early adopter bonus in the form of the Yellow Turban Rebellion Warlord Pack. The Yellow Turban Rebellion Warlord Pack, only available when preordered from a SEGA approved retailer, will contain three playable warlords for use on the campaign map. These will be He Yi, Gong Du and Huang Shao. These will bring with them three new hero classes: Healer, Scholar and Veteran and also have their own skills based on the three virtues of Taoism. Naturally, these warlords will also come with weapons and armour suitable for their use. 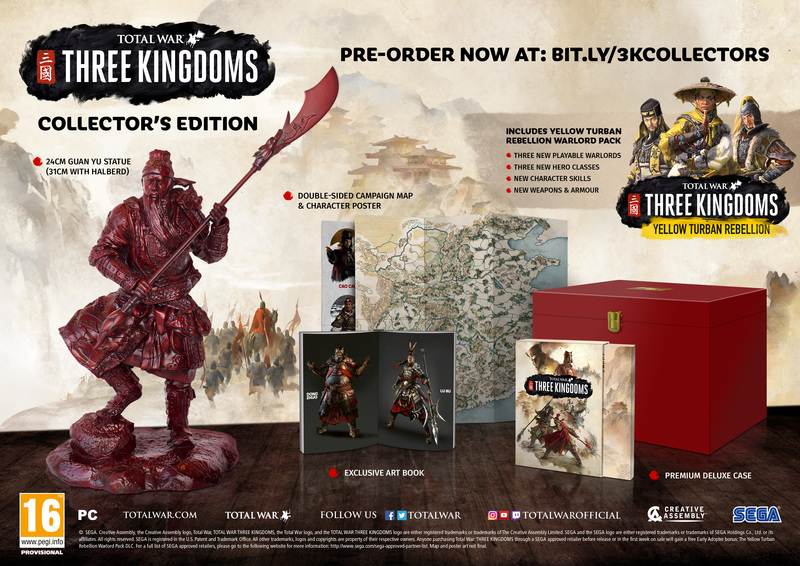 As well as revealing the release date and pre-order bonus, three versions of Total War: Three Kingdoms have been announced. These are the Digital Edition, Limited Edition and Collectors Edition. With the contents of the Collectors Edition being of particular interest to me, as a fan of the series and period. People pray to his statues when looking for courage, strength, protection, and wealth. As one of the most iconic characters of Three Kingdoms China, he features as a key character in the game and his statue is certainly worthy of adoration. detailed arms and armour. A sumptuous visual feast across the pages. High quality game case made of authentic calligraphy paper adorned with box-art that masterfully melds painterly Chinese watercolour and ink effects. Get a closer look at your cast of playable Warlords and the lands you will conquer with them. One side outlines the vast geography of China as it sits before you, the other introduces you to the varied characters and playstyles at your disposal. The Collectors Edition of Total War: Three Kingdoms will be on a limited run and only purchasable via this page, it is priced at £149.99. The Limited Edition, purchasable from select retailers, will feature the campaign map and deluxe case. At least I know how much I need to put to the side now! Is it March yet?